The Aravis is an atypical armored car manufactured in France. It’s recognizable for a distinct rectangular windshield and the smooth appearance of its armor plating. The Aravis was developed in the previous decade to meet a requirement for a tough 4×4 truck that can survive land mines and roadside bomb blasts. Nexter Systems successfully prototyped and built the first small batch of Aravis’ on time for an appearance at Eurosatory, France’s world famous arms show, in 2008. The following year the French Army placed its first orders and to date, 14 are in service as recce and observation vehicles. The Aravis should not be confused with the Sherpa, a 4×4 multirole tactical vehicle manufactured by Renault. 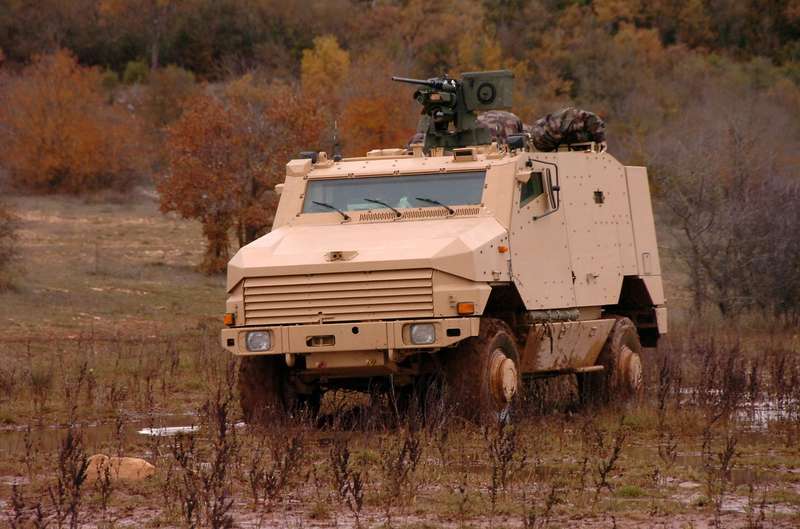 Based on its appearance the Aravis shares more in common with MRAPs like the MaxxPro or the Cougar. The Aravis, however, is a little toned down in terms of size and dimensions. Besides, the French Army have several choices of large mine-resistant trucks to choose from depending on where they deploy. Tailored for protecting its crew and passengers, the Aravis is a vehicular featherweight with robust armoring–its protection level is reportedly at STANAG IV or resistant to large caliber ammunition and machine guns. Rather than build a truck from scratch, Nexter used a licensed Mercedes-Benz Unimog U5000 cab mounted on a chassis with an independent suspension system. The Aravis packs a 218 horsepower Mercedes-Benz OM-924 diesel engine, with a maximum range of 750 kilometers. In reality, the Aravis probably runs at less than half of its 100 km/h top speed when moving across unpaved roads. An armored passenger compartment is located behind the cab, with storage bins placed at the rear of the vehicle. There is a roof hatch above the co-driver’s seat and another hatch behind the optional main armament. So far, the Aravis can be armed with a remote control M2 Browning or a 20mm cannon. Weighing 13 tons, which is below the average 15 tons for other MRAPs, the Aravis also carries fewer people. This is for deploying the Aravis via airlift to a foreign country. The driver and co-driver sit up front. Seating for five passengers are available behind them, with the passengers entering from armored side doors. The Aravis is distinctive for not having firing ports and reinforced windows. To observe their surroundings while buttoned up the passengers can use small viewing slits on either side of their compartment. The Aravis has already found exports. In 2012 Saudi Arabia ordered a large number, believed to be between 100 and more than 200 units of the Aravis. Two years later Gabon ordered a dozen Aravis with anti-RPG armor plating and a 20mm main gun for its peacekeepers in the unstable Central African Republic.